701 Center for Contemporary Art, located in Columbia, SC, invites you into interdisciplinary artist, FSU Art MFA ’16 Brittany M. Watkins’ head space as she explores the human condition in her site-specific installation at the Center, running from September 13th to October 28th, 2018. Through the combination of painting, sculpture, audio, video and performance, she transitions between theoretical and physical spaces creating a sensory experience. A native of Tallahassee, Florida, Watkins received the Juried Panel Prize of $25,000 in ArtFields 2017 for her installation titled: Accept [(Self) + Elsewhere]. ArtFields is an annual, nine-day art competition in Lake City, South Carolina, awarding more than $120,000 in cash prizes to artists from across the Southeast. Her solo exhibition, AFFECT-ED, BEING, opens at 701 CCA with an artist’s reception on Thursday, September 13th, from 7-9pm. The reception is free for 701 CCA members: there is a $5 suggested donation for non-members. Watkins was the 701 CCA Artist in Residence from August through September 2018 and the exhibition will include work created during her residency. 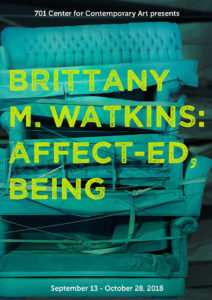 Contemporary psychology defines affect as ‘the feeling or experience that is associated with an emotion or the act of displaying and exhibiting emotions.’ By using non-traditional, discarded materials Watkins expresses the cycle of obsessive-compulsive behaviors revealed in the daily interactions between the self and society. This combined with created personas, visually or metaphorically, reveal the subject matter. Since 2013, Watkins shift from sculptural objects to theoretical concepts, has allowed her to create installations that lead viewers to explore the human psyche. Her site-specific works are a visual representation of the human condition expressed through storytelling, and repurposed materials. Watkins states that “each object presented, is rife with narrative-based signifiers highlighting the individual’s place among society alongside the functioning of the human mind.” Thus, by removing these objects from the basic parameters of their physical dimensions to the theoretical status of being, it allows for a subversive look at consumption and other afflictions. Brittany M. Watkins currently holds the position of President and Exhibitions Coordinator of 621 Gallery in Tallahassee, FL, while also teaching Contemporary Art & Design at Florida State University. Simultaneously, she plans to continue progressing as a full-time artist participating in future residencies similar to the one recently completed at 701 Center for Contemporary Art. The exhibition, AFFECT-ED, BEING, features a combination of new works created during her residency and pre-existing works. 701 CCA is a non-profit visual arts center that promotes understanding, appreciation and enjoyment of contemporary art, the creative process and the role of art and artists in the community. The center also encourages interaction between visual and other art forms. 701 CCA is located at 701 Whaley Street, 2nd Floor, Columbia, SC 29201. During exhibitions, hours are Wed-Sat 11–5; Sun 1-5. For more information, visit www.701cca.org.